Stop Snoring for Good With These 6 Anti-Snore Remedies! What are the best natural cures or remedies for snoring? My husband snores really bad and really loud. I know this is not good for his health either. He uses SnorStop and it helps a bit but not enough. He (we) need a permanent cure A.S.A.P! Hi Carla, and thanks for your question regarding natural remedies to help stop snoring. Unfortunately, this problem is also shared by many people right around the world with an estimated 90 million Americans suffering from snoring alone. Being confined to the dog house or having to sleep in the spare room because of your snoring is not fun. I would say this problem would probably be amongst the top reasons why marriages end up breaking down. Being a former "lift the roof off the house" snorer myself, and subsequently trying virtually every snoring remedy and product available, I feel I'm very qualified in this area. There are so many anti-snoring products out there that "guarantee" to stop your snoring (or your money back, blah blah) that every one on this planet should be snore free! Unfortunately, 95% of these products are rubbish (I've tried most of them) and the other 5% are so uncomfortable that the only reason you don't snore is because you don't sleep! Natural Remedy for Snoring #1... Apple Cider Vinegar (ACV): Apple cider vinegar works amazingly well for reducing snoring. One of the main causes and initial triggers for snoring is a metabolic imbalance or metabolic syndrome (and/or acidosis). This basically means your metabolism is completely out of whack, which in turn causes problems such as HBP, high cholesterol, high blood sugar levels, excess fat accumulation and breathing difficulties. All of these play a role in the onset and worsening of snoring. But apple cider vinegar balances out the body's metabolism and raises it's pH level. By doing this, acidosis is eliminated, along with the majority of health problems listed above. To use the ACV remedy simply purchase a bottle of organic apple cider vinegar with the "mother" apple (very important) and mix a tablespoon in a glass of warm filtered water. Drink this 2-3 times daily for best results. You can also add some local or Manuka honey to the mix for extra benefit and taste. Honey helps with snoring as well! Note: If you don't like the taste of the ACV liquid you can always substitute it for the capsules. These work just as well. for Snoring #2... Hydrogen Peroxide: The hydrogen peroxide inhalation therapy is a very powerful remedy for all types of breathing problems, including snoring. It not helps to "oxygenate" the body and raise your pH level, it also clears out any pathogens and parasites that cause swelling in the nasal passages. For everything you need to know about this terrific "anti-snoring" remedy, have a read of this article by hydrogen peroxide guru, Bill Munro (and be sure to watch the short video)... Hydrogen Peroxide Inhalation Method. Natural Treatment for Snoring #3... Elevated Bed: Raising the head of your bed is an easy and very effective way to stop you or your partners snoring. Some people recommend using a larger pillow to elevate your head. Although this helps to stop snoring we don't recommend it because of the unnatural position it puts your neck in. By elevating the head of your bed though, you still sleep as you normally would, but without snoring! All you have to do is raise the head of your bed by 6-8 inches using some wooden blocks or whatever you have lying around the house. It works a treat! Natural Cure for Snoring #4... Eucalyptus Oil: Eucalyptus oil is an easy way to clear the sinuses so you breathe easier during the night. Simply breathe in (sniff) some eucalyptus oil straight out the bottle a few times up each nostril before bedtime. Simple but very effective! Natural Remedy for Snoring #5... Breathe Right Nasal Strips: I've used these myself. They definitely help to open up the nasal passages and make breathing easier. Although they aren't 100% effective all the time, they certainly make a big difference and reduce your snoring considerably. Nasal strips definitely aren't a fashion statement either. You look like you're about to go out and play a match for your local Rugby team! Here's what they look like... Breathe Right Nasal Strips. Home Remedy for Snoring #6... Tennis Ball Technique: Most of us snore on our backs. The tennis ball technique works by preventing you from rolling over onto your back. What you do is sew the pocket from an old t-shirt onto the back part of your pyjama top then place a tennis ball in the pocket. When you're asleep the uncomfortable feeling of the tennis ball digging into your back when you try and roll over keeps you on your side. It doesn't work for everyone though. Some heavy sleepers still roll onto their backs and sleep all night with the tennis ball digging into them. In this case, you may need a basketball! 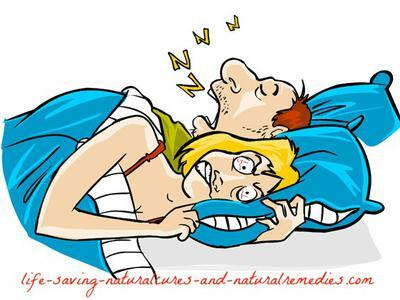 So hopefully these 6 remedies help you out Carla and finally stop your husbands awful snoring. Comments for Stop Snoring for Good With These 6 Anti-Snore Remedies!